The ICA Live Art Festival is bringing diverse and provocative performance art to the Mother City. We’ve highlighted just a few of these performances, artworks and installations. Listen to live recordings of the incredible talks delivered at this year’s conference for creative womxn. Buy tickets for 10and5’s second annual X conference for creative womxn in Jo’burg on Saturday, 13 August. 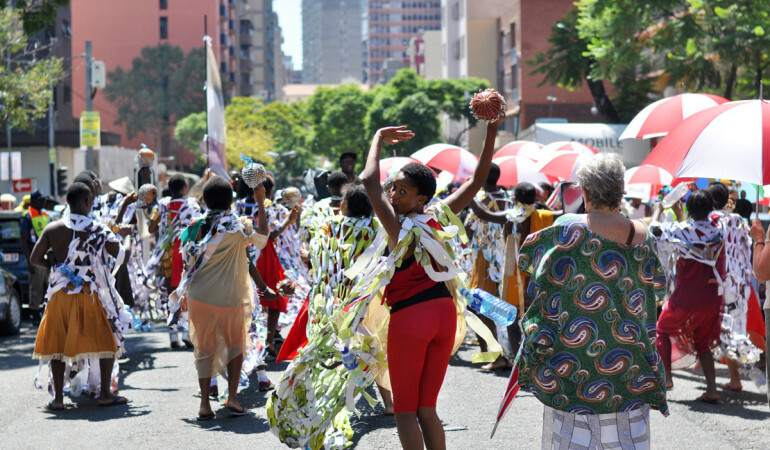 The everyday malaise of labour and long commute in Hillbrow was disrupted, showcasing a community in conversation with itself, speaking through art. A group of 15 South African artists with a name like the JHB Massive Supercrew are bound to collaborate on some remarkable ventures. This week’s creative events and art openings include 3 group shows, 2 solo exhibitions, the first in a series of creative talks, and 2 performance-based pieces. This week’s art openings and events include a group portrait exhibition, 4 solo shows, a performance intervention, walkabout, luxury brand collaboration, and the return of Invisible Cities. Performance artist Anthea Moys tells us about the importance of playing, games, rules, and engagement in her work, as well as why she’ll be challenging anyone who attends the FNB Joburg Art Fair to an arm-wrestle. The FNB Joburg Art Fair will once again return to the Sandton Convention Centre from 22 – 24 August 2014. This year’s event will feature 37 exhibitors from 8 different countries as well as an exciting programme of special projects.